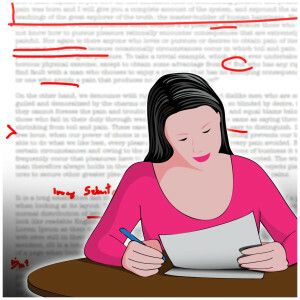 Writing on Wednesday: Reviews, Revisions and a Big Reveal! What have I been busy doing? REVIEWING a book for an academic press. This was an interesting experience. I kept imagining myself as the author whose work was being reviewed. But that didn’t keep me from being honest about the book’s weaknesses. The author can flat out write, but the book lacked some big literary elements that I deem necessary for a successful run (like a strong narrative arc) so I couldn’t recommend it for publication. As I worked my way through its 36 (short) chapters, I made notes to include in my review. Although this took me away from my own writing for a couple of days, it was a learning experience that hopefully will inform my own work as I return to REVISING my novel. I’m also critiquing manuscripts for my writer’s group’s monthly meeting next week. Another activity that takes me away from my own writing, but these people can REALLY write, so it’s like being in a small MFA workshop each time we get together. Another valuable experience. This remarkable collection provides an exhilarating range of voices exploring what happens when female friendships falter. Wise, compassionate, and smart, each of these essays is a revelation. Give your best friend a copy along with a warm, thankful hug. The essays in Dumped are ferocious and loving, devastating and hopeful, insightful and perplexing. A savage, thorny look at friendship . . . and a rare, uncensored, sometimes terrifying glimpse into the female psyche. I love anthologies. 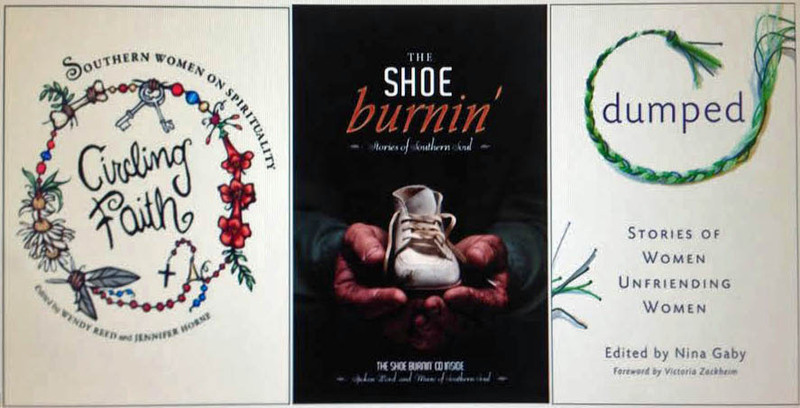 Contributing to these three wonderful collections—Circling Faith: Southern Women on Spirituality, The Shoe Burnin’: Stories of Southern Soul, and now Dumped: Stories of Women Unfriending Women—has inspired me to consider putting together an anthology myself. (That’s what I need, another project, right?) I need to finish revising my novel first, but this project is definitely on the back—make that middle?—burner! Do tell, Susan…..what’s the anthology you are considering????? I’m not completely settled on the theme for the anthology yet…. but you’ll know when I am. And I’m be picking your brain since you’ve successfully edited an anthology, Nina! 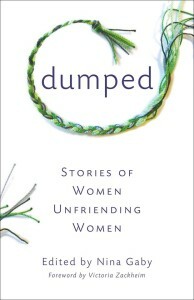 I’m excited to read DUMPED and to hear about your back-burner project. What a great analogy, Melodye (to the campfire singing). In fact, The Shoe Burnin’: Stories of Southern Soul, got its inspiration from just that–a group of writers sitting around a fire telling stories, singing songs, and tossing shoes into the fire! This is great. This truly is a subject that nobody talks about. Can’t wait to read it! Thanks for reading, Mari. Hope you order the book!